Nobody enjoys discovering a tick on their animal, but what can it mean for your horse? In this area of the country ticks are extremely prevalent and it is not uncommon to pull your horse in from the pasture, or come back from a trail ride, and discover hitchhikers. There are several species of ticks, and not all of them carry the same risk for disease. 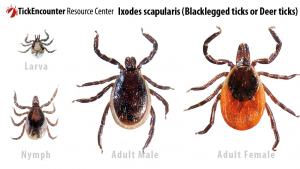 The deer tick, or black legged tick, is the species associated with carrying Lyme disease and the one that is of greatest concern to horse owners. Ticks have three developmental stages; larvae, nymph and the adult stage. As a larvae, the deer tick is no bigger than a small dot and searches out a blood meal, most often from a rodent. If the rodent it feeds on is infected with the spirochete bacteria, Borrelia burgdorferi, the tick will become a carrier of Lyme disease. Larvae must have blood meals to further develop and molt. It must be attached to the host for 12-24 hours before it infects the host with the disease, so checking your horse daily for ticks can prevent transmission of the disease. The larvae molts and becomes a nymph, usually in the fall season. The nymph will remain inactive all winter and become active again in the spring. The nymph will attach to a new host in the spring and remain attached for several days, the body of the tick becomes engorged with blood. The nymph then drops off and molts into the adult stage. The adults tend to hang out on tall grasses and in trees as they seek new hosts. Adult ticks will be able to mate and reproduce once another blood meal is consumed. After mating females will lay their eggs and the cycle will begin again. In its entirety the cycle lasts approximately 2 years. If you happen to find a tick, or several ticks, on your horse, care should be taken when removing the intruder. Never grasp the body of the tick as in doing so you may actually inject the toxins into your horse. Use tweezers (or they make a tool specifically designed to remove a tick) and grasp at the base where the head is attached as close to the skin as you can. Pull the tick straight out gently to ensure that all the mouth pieces are removed at the same time. Regardless of the species, tick bites can leave angry welts on your horse and sometimes a bald area as well. Applying triple antibiotic ointment to the bite and an insect repellent, such as swat, will prevent further infection. If the swelling is significant, banamine can also be given to reduce inflammation. Horses who are extremely bothered by the bite and are itchy may require topical or systemic steroids. Prevention of the bite in the first place is best when possible. Tick repellent sprays, such as Frontline (for dogs and cats) can be used on legs and tails to hopefully keep ticks from attaching. Other insect repellents and fly sprays are also great at discouraging ticks from attaching. Frequent grooming and bathing can go a long way in finding ticks early before they are able to transmit disease. It is however often difficult to know how long a tick has been attached and monitoring the horse for signs of lyme disease will be important. Symptoms of Lyme disease varies greatly between individuals, making a diagnosis difficult. If suspected blood work is indicated. Shifting lameness, poor performance, changes in behavior, edema, and joint swelling are all possible presentations. Tick borne fever can result from a tick bite, and may take several days to manifest. The fever is often high and as a precaution will be treated with doxycycline or oxytetracycline (antibiotics of choice for Lyme disease), along with NSAIDs, like banamine, for the fever. A diagnosis of Lyme disease from blood work will mean weeks of treatment with antibiotics and follow up blood work. Don’t forget that you are at risk for infection from tick bites as well, along with your other furry four legged companions (dogs and cats). Be safe this tick season!